Wade and LSU may be in hot water for recruiting violations, but nobody is going to pay bribes to get into LSU. In regards to the bribe-for-admittance scandal, how can these non-revenue sports coaches get these bogus kids into USC, Stanford, Texas and Yale? Don’t these schools have a centralized admittance process? Or is each coach given an a number of admittance slots that they can sell? The athletic teams may be exempt from any quota systems, but how do minor sports get kids into the universities—especially wealthy offspring of movie stars, politicians, executives, etc, who don’t even want to be there. the answer is simple...the Coach gets paid off....the kid is admitted, then has an "injury", unable to compete, but still gets to stay in school.....since they are "injured" the coach can then go and recruit another kid since they do not count against the schollie limit....as Sonny and Cher once sang..."The beat goes on"
But how does the “paid” coach get an academically unqualified student past the admissions process? The scandal brings into question the entire admissions process of the universities involved. I guess if the bogus athlete meets NCAA minimums, they’re in. Does Tulane accept the NCAA minimums for all the non-revenue sports? Given we supposedly only recently ended the disastrous “Tulane Model” for our major revenue sports, I presumed that our academic requirements for the non-revenue sports were well above NCAA minimums—perhaps not. Several of the outed parties did not have the grades or test scores to get into the named schools. They got into the "side door" thanks to the bribed minor-sport coaches--and an admissions process that has a hole in it. Just because the bogus students have been able to stay in school, thus far, doesn't change the fact that other better qualified applicants were denied admissions. It's also worth noting that at some Ivies, Harvard in particular, the graduation rate exceeds 90% suggesting that once you're in you will graduate. I don't know what Tulane's graduation rate is now, but back in the day, the 2-year foreign language and N.O. social distractions took a heavy toll on that stat. Why has LSU not fired this scumbag ? There is no way the FBI tapes can be interpreted as anything other than a bribe with an unsolicited admission that wade has paid other bribes in the past with other "more talented" than Smart "more easily". And how could LSU allow smart to continue to play being on the receiving end of a $100,000 bribe ? Of course it would be premature to do anything permanent until the criminal investigation is complete. I would be surprised if LSU has not already contacted potential coaches. Tough call when you don't know about potential future sanctions. Funny. Hard to believe but Alleva’s contract with Wade actually worst than Dannen’s deal with Dunleavy. I wonder if Wade the master scammer could end up in prison and still get paid by LSU? 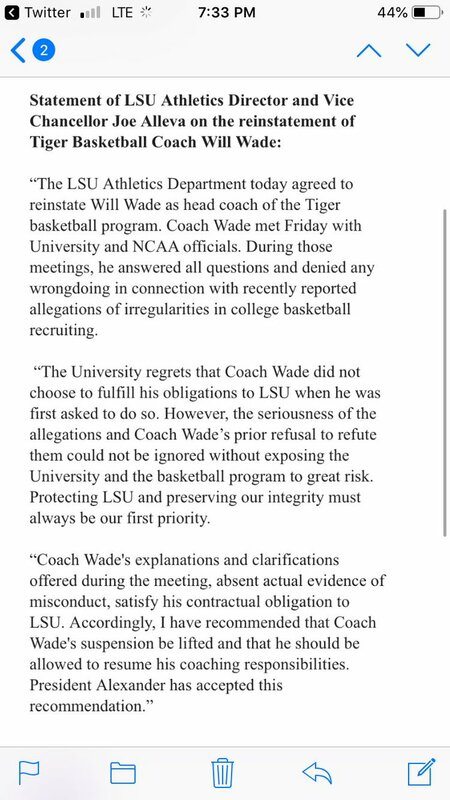 LSU has not made its ultimate plans known in regard to Wade, who signed a 6-year, $15 million contract with LSU in 2017 that runs through June 30, 2023. The contract did not include a buyout. The school would owe Wade the entire amount were he to be fired. There are a variety of (morality etc) clauses in his contract that would prevent that from happening and would allow Lsu to severe ties and pay nothing. Possibly even claw back some money. He just hasn’t been officially charged with anything yet, if he is found guilty of anything they’ll pay nothing. The tape is being used by the defense of someone that has nothing to do with LSU. It's possible Wade slides through this unscathed. Anything is possible but the tape is now out there and the NCAA is on it. He's got to come up with a plausible explanation or he's done. He's got a new lawyer who also represents Pearl and at least one other coach that is caught up in this and is indicating he's now willing to talk. Looking forward to what story he's going to tell. The tape was out in October. It's not new or news. The refusal by the coach to meet with his superiors is what got him suspended. Again, I haven't read that he's under investigation (though I see your point, it's silly that he wouldn't be) as a result of the tape. But there's nothing that wasn't public before the season began. I believe that was a different tape they tried to play at the first trial. This one is clear and to the point . He was buying Smart and had bought others before him. That's why he got called in this time when he didn't the first go around and it's why now he also has to talk to the NCAA. As shocking as this is, it was somewhat predictable. Wade himself wasn't under investigation. LSU hasn't been a good basketball program in some time, and finally found a coach that knows how to win. It would be fitting if the NCAA later came down on them and LSU had to forfeit a bunch of wins. Definition: If someone is successful at something because he cheated, he will ultimately pay for his deception. The proverb cheaters never prosper simply means that those who gain an advantage at something by cheating will ultimately have to face the consequences of their actions. You got to just love LSU. The FBI has him on tape and he so he just tells LSU he didn’t do anything wrong and they re-instate him. The no backbone NCAA will just move on as well. It will just encourage more cheating if this is not further investigated with consequences. They could have him on video tape paying cash to his recruits and their families and he’d still be in good shape with the NCAA . You have to read what LSU said closely. What they said was that by meeting with them and denying wrongdoing he has met his contractual obligation. So they can't fire him without paying off his contract. The local coverage said the NCAA is waiting for the FBI to finish their investigation before they start theirs. It will take awhile but he likely gets canned and they forfeit a bunch of wins and tourney money. It was also pointed out that their current recruiting class is 13th in the SEC and 91st in the country. Things aren't going well while he's having to stay on the down low. Listening to WWL radio today and they had a poll: Did LSU make the right decision by rehiring Wade? Over 85% of respondents said YES. So this is how it works, I know from experience. Coaches are given a tier system, where they can give preferential admittance. They have students that they can support and the number gets smaller as each tier progresses. It is just how it has worked forever. I will leave it at that, u can message me if u want to know more. Alleva looks like the 1st casualty so far. Just maybe the next AD won’t be afraid to play us. More recently, Alleva drew fan ire for suspending men’s basketball coach Will Wade, who was caught on an FBI wiretap investigating a recruitment scandal. Wade was reinstated earlier this week. Help me understand this. Wade bribes players. Alleva 'suspends' Wade. Fans are angry at Alleva. What? Wade was a winner. Alleva has actually held LSU back from their real potential.